Deposits of limescale not only that it looks ugly, but it can cause big problems and failures to equipment in our home. Unfortunately, today we all face with the lack of quality water and most of us buy bottled water for drinking, but, appliances in our homes do not enjoy that privilege. In many households in US water is hard, meaning that the washing machines, water heater, toilet tank and other appliances are often covered with layers of limescale. Although there are different cleaning products which can be use to remove this, there are also some natural ways that can successfully remove this problem and at same time save you money. When it comes to toilet tank, in this article we present one trick, trick which will help you to clean your tank and entire toilet bowl. All you need for this cleaning trick you probably have it allready at home-Vinegar. Vinegar is an excellent substitute for many cleaners that are filled with harmful chemicals and plus is cheaper. 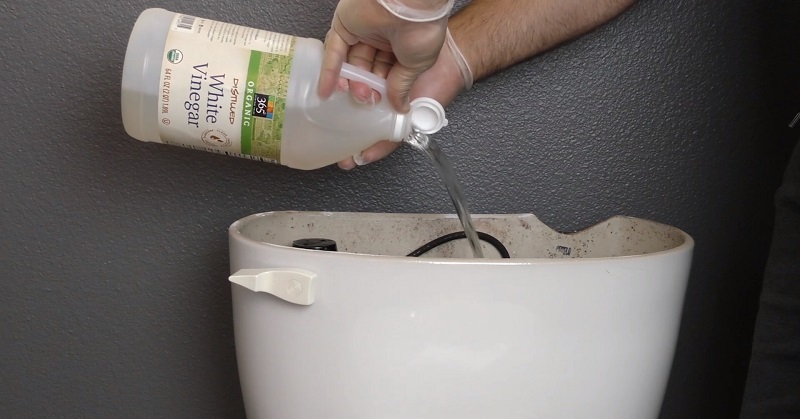 White vinegar is perfect for cleaning the bathroom. It’s a great to remove bacteria also and mold and thus helps prevent erosion. First, put your gloves on, open your toilet tank and pour 1 liter vinegar into the tank and let the vinegar sit for at least 30 minutes, time which will be enough to eat away the mineral deposits that build up over time. After half an hour, you can flush the toilet once and then turn off the water supply to your toilet tank and flush the toilet again which will empty the tank. Using all purpose cleaner and brush, scrub inside of the tank, turn water supply on and flush the tank again. Like this, your toilet bowl will be clean from bacteria and your toilet tank will be clean from bacteria, mold, rust, limescale etc. With this cheap and simple trick you will have perfectly clean toilet tank and bowl. You can use this trick few times per year.